A spectacular music lineup has been announced for ShipRocked 2019, celebrating a decade of rock 'n' roll on the high seas January 26-31, 2019 onboard Carnival Valor for the first time. The greatest vacation ever will feature performances from PAPA ROACH, BULLET FOR MY VALENTINE, I PREVAIL, NOTHING MORE, SUICIDAL TENDENCIES, SEVENDUST, MOTIONLESS IN WHITE, and more, expanding to five days and nights, departing from Galveston, Texas, with stops in Cozumel and the Yucatán in Mexico. Staterooms for ShipRocked 2019 are sold out, but a wait list is available at ShipRocked.com. 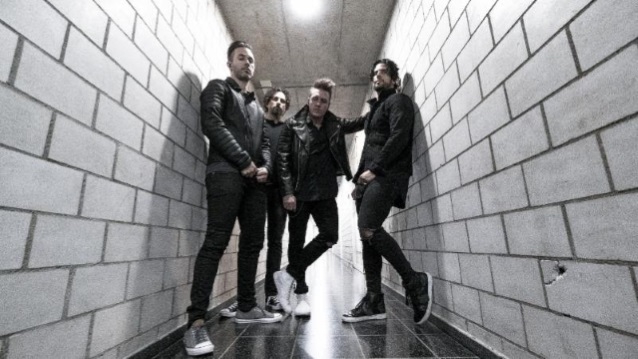 Jacoby Shaddix of PAPA ROACH said: "We are so excited to join the 10th-anniversary cruise… It's our third time on the bill and our first time headlining! You can expect a few surprises and a real rock show on the open sea — we can't wait to see everyone taking part next year!!!" Lajon Witherspoon from ShipRocked veterans SEVENDUST said: "I am so excited and so looking forward to taking part in the 10th anniversary of ShipRocked. We have met so many incredible people throughout the years that have become part of the SEVENDUST family. I always look forward to celebrating music and life with them at sea as well as on land. ShipRockers rule. God bless everyone and see you soon." 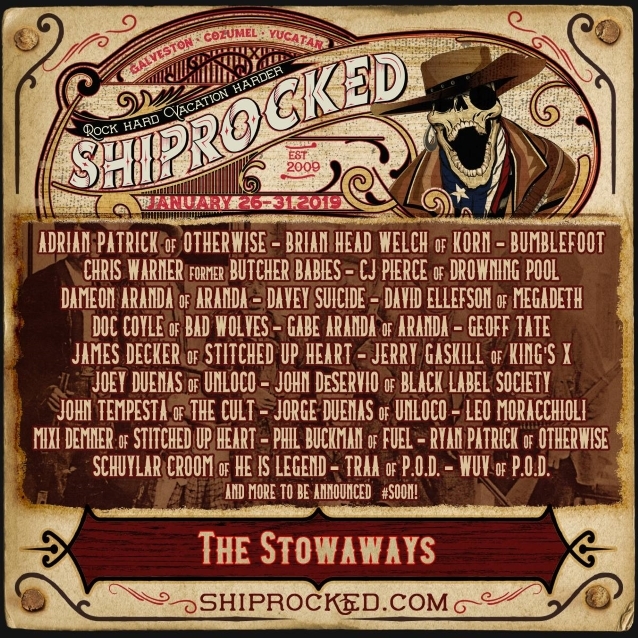 In addition, ShipRocked's own featured all-star band THE STOWAWAYS will include: Adrian Patrick and Ryan Patrick (OTHERWISE), Brian "Head" Welch (KORN), Ron "Bumblefoot" Thal, Chris Warner (formerly of BUTCHER BABIES), CJ Pierce (DROWNING POOL), Dameon Aranda and Gabe Aranda (ARANDA), Davey Suicide, David Ellefson (MEGADETH), Doc Coyle (BAD WOLVES), Geoff Tate, James Decker and Mixi Demner (STITCHED UP HEART), Jerry Gaskill (KING'S X), Joey Duenas and Jorge Duenas (UNLOCO), John Deservio (BLACK LABEL SOCIETY), John Tempesta (THE CULT), Norwegian YouTube sensation Leo Moracchioli, Phil Buckman (FUEL), Schuylar Croom (HE IS LEGEND), Traa and Wuv (P.O.D. 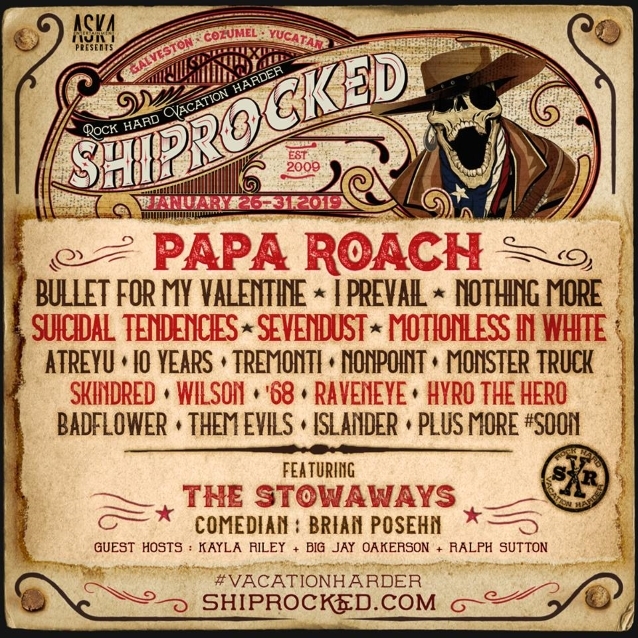 ), and more, plus various special guests from ShipRocked bands. ShipRocked 2019 also welcomes comedian Brian Posehn and guest hosts Kayla Riley, Big Jay Oakerson and Ralph Sutton. ShipRocked guests will be treated to a special advance screening of Brian "Head" Welch's new documentary film "Loud Krazy Love". Head explains, "I am so excited to be back on ShipRocked for the 10-year anniversary and to host a special screening of my new film 'Loud Krazy Love'. Watching the movie together with my friends in other bands and ShipRockers is going to be amazing, as they will all relate to the wild rollercoaster ride of life in the rock 'n roll world." ShipRocked creator and producer Alan Koenig of ASK4 Entertainment says: "Apart from being one of the most epic vacation experiences, ShipRocked is a celebration of the best live bands in rock music, regardless of generation or subgenre. Over the last nine years, we've been fortunate enough to have an incredibly diverse group of hard rock, alternative rock, punk and metal artists grace our stages, and our 10th-anniversary sailing will be no different. We are immensely proud of the 2019 lineup and our exclusive all-star band, THE STOWAWAYS. We can't wait for our guests to rock hard and vacation harder in January and look forward to continuing in the same tradition for another 10 years." Produced by ASK4 Entertainment, ShipRocked is a once-in-a-lifetime experience that provides guests with the opportunity to vacation with their favorite bands, meet new friends, and reunite with old ones year after year. In addition to unique performances and musical collaborations, ShipRocked onboard and beach activities include photo meet and greets with band members, artist hosted events and activities, crazy theme nights, after hours parties and more. ShipRocked guests will enjoy luxury accommodations onboard the Carnival Valor throughout the vacation. Carnival Valor features multiple gourmet dining options, including Guy Fieri's Guy's Burger Joint, BlueIguana Cantina, Mongolian Wok, Ol' Fashioned BBQ, and more. With 22 bars and lounges, well appointed sleeper accommodations, a tranquil spa, casino, fitness center, mini-golf, wet and wild waterslide, and multiple pools and hot-tubs, guests will have a frontier of options to choose from. For more information, visit ShipRocked.com.